Both sugar and spice are in my blood. Hardly surprising, when you consider that I am a descendant of Indians who crossed the great and unknown stretch of water generations ago in order to work in the thriving sugar industry in British Guiana. Generations passed, British Guiana became the independent country Guyana, but sugar remained central to my life. I grew up on sugarcane plantations, within smell and sight of the gloriously fragrant golden crystals and I am still only partially convinced that beet sugar is proper sugar. It doesn’t smell right. Caribbean coconut toffees, Persian saffron and almond toffee, treacle toffee, Dutch coffee blocks (Haagsche Hopjes), honeycombs and more. Not just simply caramel and nuts. There is so much more to brittles: spiced, spicy, buttery, salted, with macadamias, pistachios, almonds, peanuts. Including homely treats such as peppermint creams alongside nougats, marshmallows, Turkish delight, egg candy (yemas), coconut ice Indian style, halvas – lots to choose from. Enter the entrancing world of Indian milk-based delicacies, sometimes with nuts or even with gram (chickpea) flour. There is also a recipe for making your own paneer at home – easier than you could ever imagine. And of course fudges from around the world, in many flavours and textures, including Dutch and Scottish tablet. Marzipan really is magical, especially when you make it yourself. Almonds are only the beginning. You can add richness to produce the Spanish Toledo marzipan, or you can make my version of the delectable French calissons. And then there is pistachio marzipan bursting with Middle Eastern flavour as well as Indian cashew marzipan or kaju burfi. And once you’ve made your marzipan, you can shape, fill, dip and coat to your heart’s content. I have never met a nut I didn’t like. Honestly. Coconut, almonds, walnuts, pistachios, cashews, hazelnuts, pine nuts, even pili nuts … you name it, I have great affection for it. This section contains many of my own favourites: macaroons of various kinds, including coconut, almonds and walnuts, pistachio and sesame barazeh, flourless almond biscuits and succulent tiny cakes, sometimes with orange flower water, rose water and pine nuts to make them even more delicious. What’s not to love with a truffle? Gorgeous chocolate and other lovely stuff slowly melting on your tongue. And they are so easy to make at home. Try your hand at these mouth-watering morsels which include truffles made with raspberries, green tea, dried fruit, nuts, spices, chilli and vanilla and allow yourself to be awed by the fabulously silky Dutch cream truffle. Strangely enough, there are people who don’t like chocolate. My father – yes, my very own father – does not care for chocolate. Can you believe it? I’m still struggling to do so, after so many decades. But those of us who love the stuff are sometimes left with a good amount in the bowl, after melting chocolate for dipping truffles, say. This section tells you how to deal with it. Just about the most satisfying chocolate hit possible, but there is no single recipe to satisfy all brownie lovers. 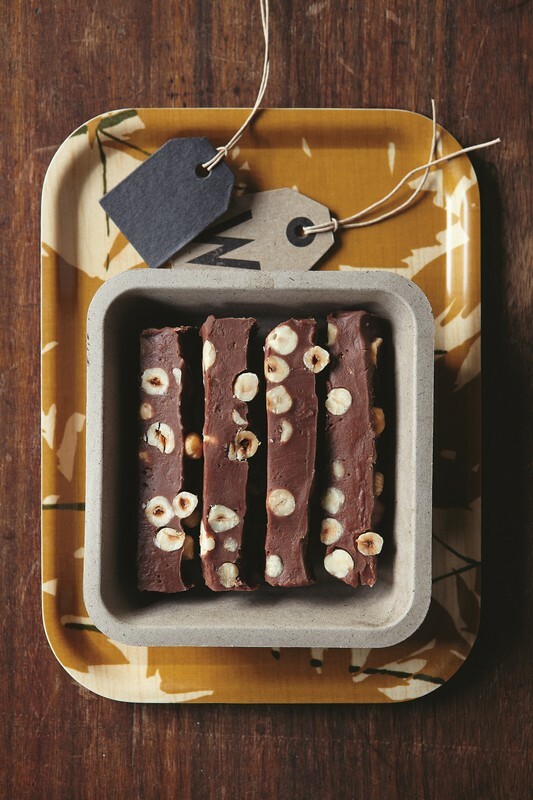 This chapter contains brownies in several textures and flavours: classic, intense, cheesecake, cherry, cranberry and white chocolate, hazelnut and orange brownies. The last have proved extremely popular with readers of Sugar & Spice. What is your preference? Buttery Scotch shortbread fingers or green tea ones? 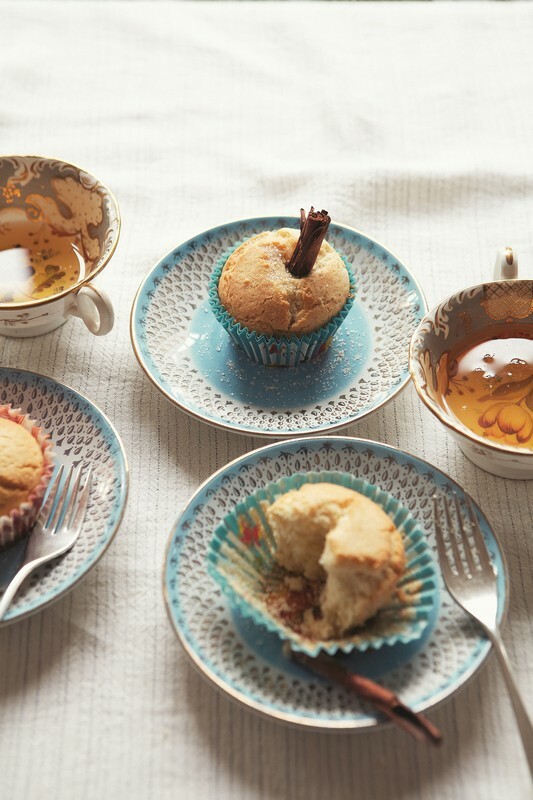 Flavoured with lemon, walnut, rosewater or spices? Drenched in syrup? Bursting with chocolate flavour and doused with white chocolate for good measure? Quite a selection here for you to choose from. Once you have a good plain, sweet or nutty pastry, you can add all sorts of fillings to make chocolate pecan tartlets, crunchy nut tartlets, Canadian butter tarts, rich and smooth chocolate tarts or even pistachio cups filled with mango shrikhand, among other things. 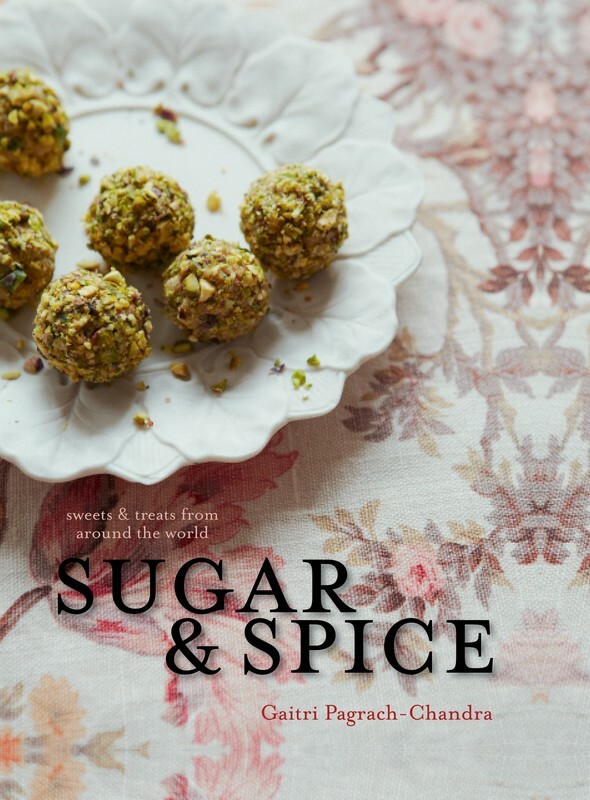 Melt-in-the-mouth cinnamon and rice flour Portuguese cakes, tipsy Spanish cakes, English and French madeleines, Lamingtons, Sarah Bernhardts, marzipan-coated fancies and the most divine ganache-filled chocolate squares are some of the tiny treats to be found in this chapter. 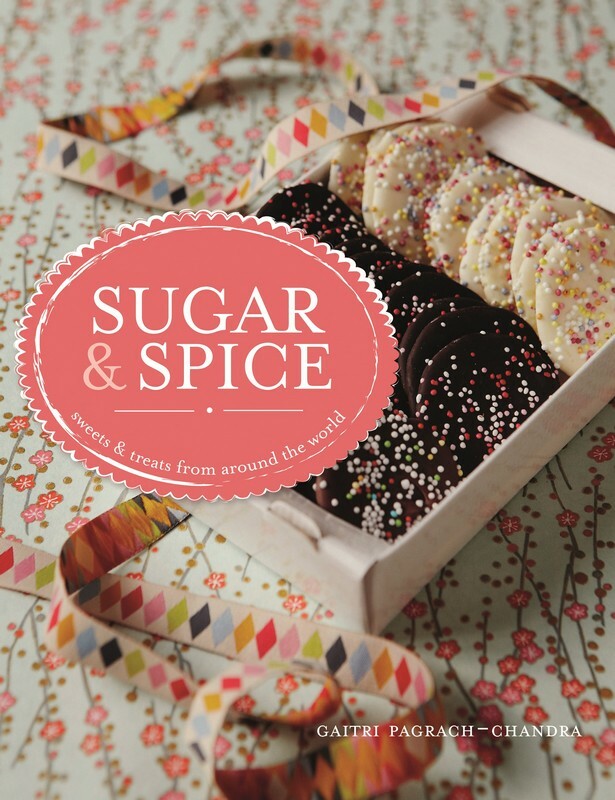 Sugar & Spice: sweets and treats from around the world, Pavilion 2102; Interlink h/b 2012, p/b 2013; W&V Press 2012. 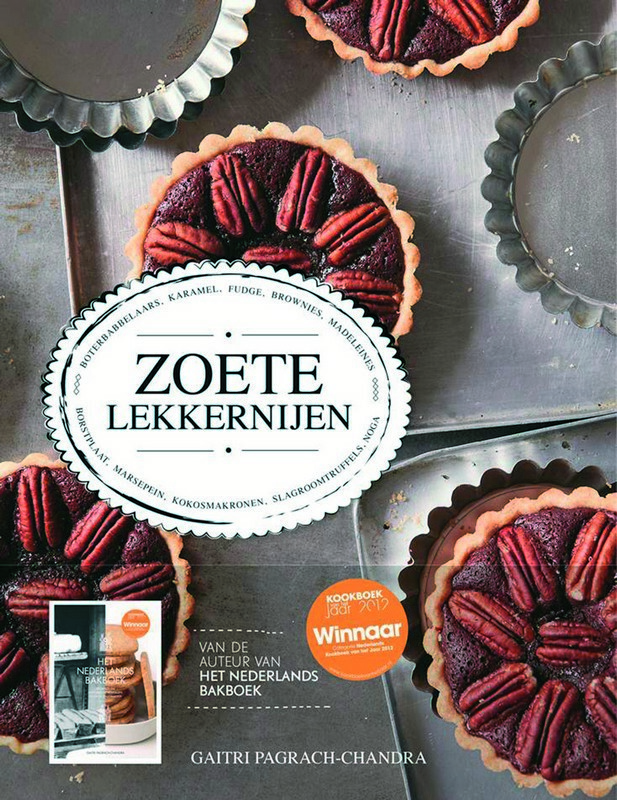 Translated into Dutch as Zoete Lekkernijen, Kosmos Uitgevers 2013. Photography by Yuki Sugiura, food styling by Aya Nishimura. Growing up on sugar plantations, Guyana-born food historian Pagrach-Chandra (Warm Bread and Honey Cake) developed an enthusiasm for sweets that hasn’t waned. Here she explores the history of sugary treats like toffee, truffles, marshmallows, marzipan, and fudge. She shares unique multiethnic confections (e.g., Simple Semolina Halva, Gulab Jamun, Turkish Delight) as well as numerous cookies, tartlets, and small cakes that make great edible gifts or teatime snacks. Readers will need a candy thermometer, but few specialty molds or ingredients. VERDICT This book offers great variety for the novice confectioner and pairs nicely with Michael Krondl’s Sweet Invention. Starting with her first book, Windmills in my Oven, Gaitri has become known for her satisfying recipes that sit alongside wonderful anecdotes and histories. ... Her work proudly reflects her multi-cultural background, and introduces readers to a whole host of delicious treats from around the world, so no matter how experienced a baker you are, you're bound to find something new to try! 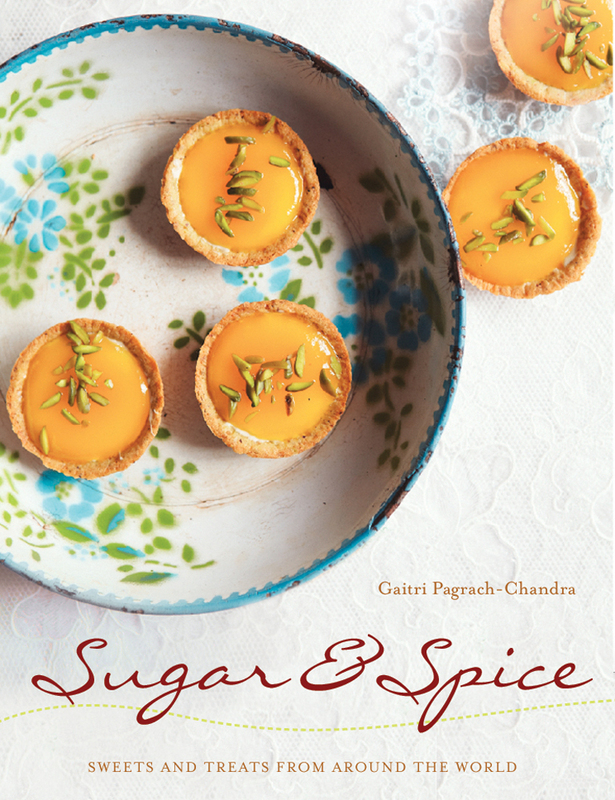 Pagrach-Chandra draws from both European and Asian traditions to present recipes offering the home confectioner a wealth of out-of-the-ordinary options that go far beyond everyday cookies and cakes. For those with a sweet tooth, books like this are truly irresistible. If you want a cookbook with fresh, new ideas for sweet treats, look no further than this lovely collection. Included in 'The best food books of the year 2012' The Guardian.